The most impressive historical sights are Pompeii and Herculaneum. They are situated not far from Naples. These ancient cities were ruined when Vesuvius exploded. The eruption was so strong that the whole cities had been buried under ashes. Capri island which is known for its beauty and also like a splendid residence of roman emperor Tiberius is located opposite Naples and can been seen in the clear day. 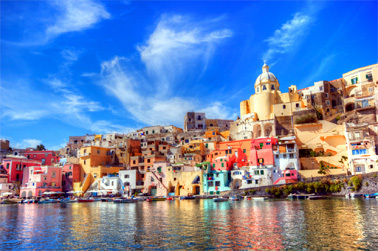 Naples has always been the most prosperous city of the Southern Italy. Luxurious villas were constructed in it by the rich people. Naples is the big commercial and industrial city. The most important Italian corporations are based in Naples. The president of Italy also likes Naples and has the residence in it. Naples is famous for the fact that pizza was invented in this city. The best well-known pizza was prepared in Naples and got the name after the Queen. Music of Naples is very popular, especially the romantic guitar. 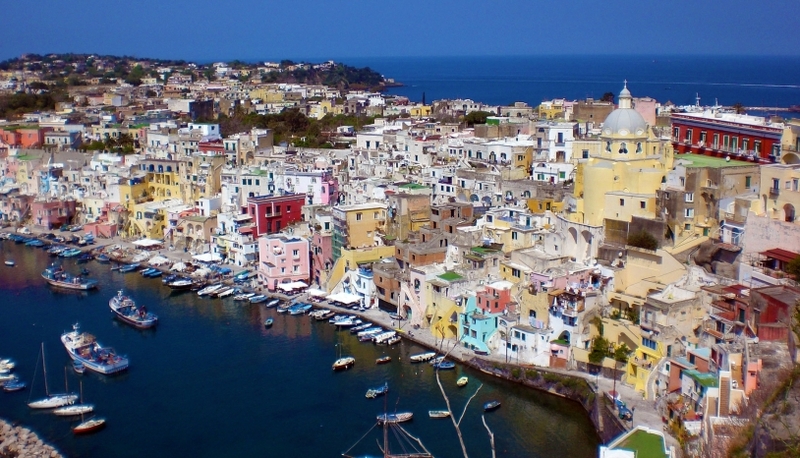 Folk songs composed in Naples are sung all over Italy. The Duomo cathedral is devoted to saint Jenuarius. He is the patron of Naples. It's considered that his blood is kept in a special flask in the crypt. Twice a year a miracle occurs: the solid blood of the saint transfers into liquid. People have believed in this miracle for centuries. Today the bright festivities are held to celebrate the day of the city's patron. Naples is a big city and there is a subway with beautiful stations in it. The architecture is splendid. The station “Toledo” is a real piece of art. There is an own football team in the city, famous Napoli. Stadium San Paolo was constructed for training them. It attracts fans from the whole Italy. Naples can boast the oldest opera house in Italy. It is Teatro di San Carlo. The King Charles the 7th decided to build the theatre in Naples. It was open in 1737 and became the oldest opera in the world. Beautiful interiors with rich decorations and best music performed in this theatre attract spectators from all of the world. The oldest in Europe University was opened in Naples. There is a charming promenade along the bay of Naples running from Castel dell Ovo. It's pleasant to stroll along the seaside admiring wonderful views. It's possible to see even more enchanting views from the top of the castle. The guests who feel a little bit tired from sightseeing can relax in one of the shady gardens of Naples. A nice park Villa Comunale is spreading along the coast. It was created by the king and was called royal garden. Naples is an important transport hub. There is an international airport at the city as well as the railway station with speed trains to other cities of Italy. It's the biggest port in Southern Italy. Unfortunately Naples had ill reputation in the 20th century. The Camorra is notorious mafia of Naples. It had great influence in the city's life and corruption was everywhere in Naples, but today the situation is much better.